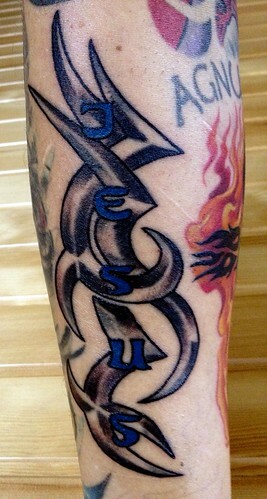 Spent a few hours last night laying some of the groundwork for getting more of the second sleeve done. 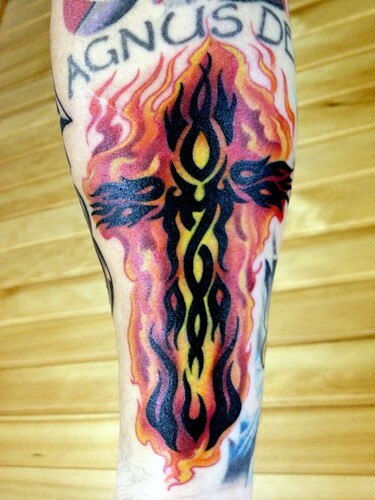 This is was re-lining and darkening of my existing cross, and I think the flames look pretty darn sweet. And as I looked at my Flickr album, I realized I never took any pics of the work done last year. =( Since I can't take those pics on my own, I'll have to get Ang to take some tonight. The next step will be finishing filling in the forearm, and then need to get the concept for the top done, which will include re-working the flaming skull I got 19 years ago. Looking forward to getting the sleeve finished this year!